What is Thymosin Beta 4 (Tβ4)? Tβ4 is a naturally-occurring regenerative peptide that exists in the human body. 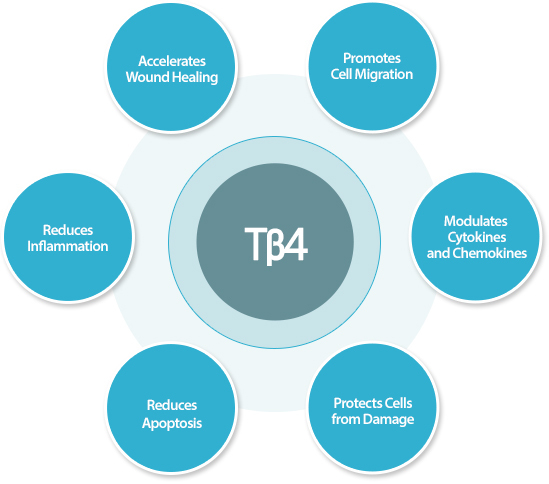 Tβ4 has multiple mechanisms of action, including, promotion of cell migration, cell protection, decrease of apoptosis, promotion of stem cell recruitment and differentiation, collagen maintenance, decreased inflammation, etc. It has shown efficacy in animal models of dermal injury, cardiac ischemia, stroke, spinal cord injury, and traumatic brain injury. It is safe and well tolerated when give topically, systemically, and to the ocular surface. It is thus a bioactive pharmaceutical that can be used to treat various diseases. RegeneRx Biopharmaceuticals, Inc. has completed several clinical trials for various diseases using three formulations with Tβ4. ReGenTree is conducting Phase III clinical trials for patients with dry eye syndrome and with neurotrophic keratopathy in the USA. In particular, two types of formulations containing Tβ4 have received Orphan Drug Designation from the USA FDA as a treatment for Epidermolysis Bullosa and for Neurotrophic Keratopathy. Thymosin beta 4 promotes corneal wound healing and modulates inflammatory mediators in vivo. Thymosin beta 4 promotes corneal wound healing and decreases inflammation in vivo following alkali injury. Thymosin beta 4 and a synthetic peptide containing its actin-binding domain promote dermal wound repair in db/db diabetic mice and in aged mice. Treatment of chronic nonhealing neurotrophic corneal epithelial defects with thymosin beta4. Thymosin beta4 promotes angiogenesis, wound healing, and hair follicle development. Thymosin β4: a multifunctional regenerative peptide. Basic properties and clinical applications. Thymosin beta4 promotes human conjunctival epithelial cell migration. Thymosin beta 4: A novel corneal wound healing and anti-inflammatory agent. Reversal of second-hand cigarette smoke-induced impairment of corneal wound healing by thymosin beta4 combined with anti-inflammatory agents. Thymosin beta4 and corneal wound healing: visions of the future. Thymosin beta 4 inhibits TNFinduced NFkappaB activation, IL-8 expression, and the sensitizing effects by its partners PINCH-1 and ILK. Qiu P, Wheater MK, Qiu Y, et al. Sosne G, Chan CC, Thai K, et al. Thymosin beta 4 suppression of corneal NFkappaB: a potential anti-inflammatory pathway. Sosne G, Qiu P, Christopherson PL, et al. Thymosin-beta4 inhibits corneal epithelial cell apoptosis after ethanol exposure in vitro. Thymosin beta4 inhibits benzalkonium chloride-mediated apoptosis in corneal and conjunctival epithelial cells in vitro. Thymosin beta-4 and the eye: I can see clearly now the pain is gone. Thymosin beta-4 upregulates anti-oxidative enzymes and protects human cornea epithelial cells against oxidative damage. Protection of thymosin beta-4 on corneal endothelial cells from UVB-induced apoptosis. Table modified from “Primary mechanisms of thymosin β4 activity in dry eye disorders and other tissue injuries,” Invest. Ophthalmol. Vis. Sci. 56:5110-5117, 2015.